Legalising nicotine vaping: could it reduce poison harms? 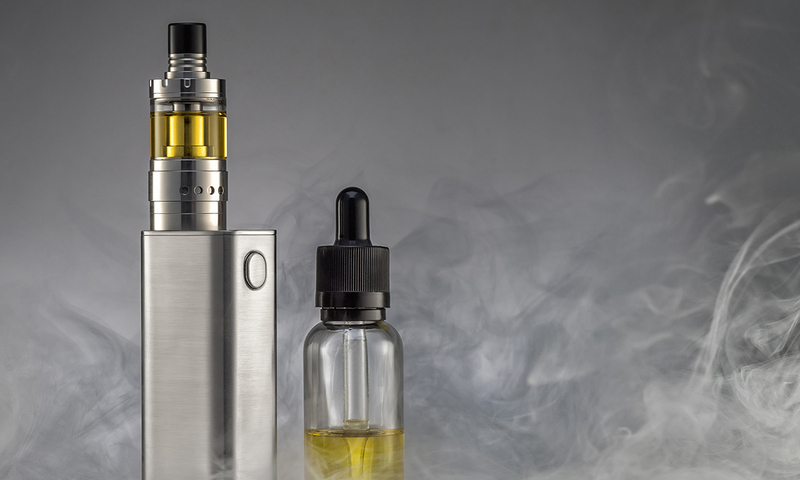 NEW research showing a rise in calls to Poisons Information Centres about nicotine-containing e-cigarette liquids begs the question – would legalising and regulating nicotine vaping make it safer? 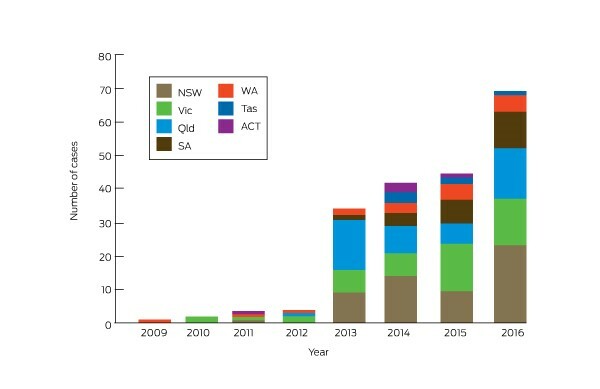 Published online by the MJA, the research, led by Carol Wylie, manager of the Queensland Poisons Information Centre (PIC), shows that the number of calls to PICs about vaping liquids rose dramatically between 2009 and 2016, particularly after 2013. Numbers of cases related to e-cigarette exposure reported to Australian Poisons Information Centres, by calendar year and state. No calls were received about cases in the Northern Territory. “Of 202 sequential e-cigarette-related cases, 38% were from relatives of children worried about their exposure to the liquid component of an e-cigarette after children were found with uncapped vials, sucking the mouthpiece, drinking from separated liquid containers, inhaling the liquid, eating the cartridge, or having splashed liquid in their eyes,” Wylie and colleagues wrote. Speaking in an exclusive podcast, Ms Wylie told InSight+ that the biggest problem facing PIC staff was the inability to verify nicotine dosages. “[When someone calls a PIC seeking advice] we need to find out as much as we can about the product involved,” she said. “That would include things like brand names, ingredients, strengths of the product. And this is particularly relevant for electronic cigarettes, because a lot of [the liquids] are imported, and we are often unable to get the exact strength of the product. Regulation, of course, means legalisation, a fraught question for Australian regulators. But recent research shows that e-cigarette liquids are in dire need of labelling, storage and safety guidelines. A study by Chivers and colleagues found that nicotine was detected in six out of 10 supposedly “nicotine-free” e-liquids. Also found in all 10 of the test e-liquids was 2‐chlorophenol, classified as “acutely toxic by the Globally Harmonized System of Classification and Labelling of Chemicals”. “It is a real challenge for regulators,” Ms Wylie told InSight+. “The fact that these products are mostly imported means that the regulations that we have for other scheduled products and other pharmaceutical products are not in place. “For the majority of calls that we get to the poison centres about regulated products and pharmaceuticals, we have a significant degree of confidence in the strength that’s provided on the label, and that means we can conduct our risk assessment without too much concern. “Other recent literature suggests that the amount reported on the bottle is not the same as what’s been found in there. “We had [a call about] one product that was as strong as 200 mg of nicotine per mL,” she said. “You would not need very much in a 10 kg infant to be a problem. A mL would be enough to cause toxicity. Early symptoms of nicotine poisoning include vomiting and nausea, according to Wylie and colleagues. “Sometimes palpitations, increased heart rate; some people get hypersalivation, and seizures have been reported. These are early symptoms, what we would call stimulatory symptoms,” Ms Wylie said. It’s possible, Ms Wylie says, that the PIC study underestimates the total incidence of e-liquid poisonings. “In poisonings, not everybody rings a poison centre, which would suggest that we are under-reporting, because there will be cases that we never hear about. “The other thing that’s interesting about electronic cigarettes, of course, is because they’re not legal in Australia, there may be some reluctance in some people to ring us, if they’re worried about any legal repercussions. “If the products were legislated to use legally, we could increase the legislation on safety and labelling. In the absence of that legislation, Ms Wylie believes GPs have a role to play in increasing the safety of e-liquid use among their patients. “If GPs know they have a patient using electronic cigarettes, particularly if they had young children in their family, they could remind them by saying, ‘make sure you’re keeping these safe and away’,” she says. Nicotine is potentially toxic, but like other research, this study found that poisoning is rare and usually mild. Most cases result in prompt vomiting and serious outcomes are very rare. There were no serious adverse events or deaths. Internationally, there have been only a handful of deaths from accidental exposure internationally since e-cigarettes were invented in 2003. Exposure to nicotine in this study was rare: 202 cases out of 1,312,000 calls to Poisons Centres over the 8-year period. That is less than 1 in 5,000 calls. It is important to balance any risk with the huge potential public health benefit of vaping as a far safer alternative for smokers who are unable to quit with conventional strategies. Continuing to smoke kills 2 in 3 long-term smokers. Ms Wylie is right that the solution is to regulate these products, not ban them. This will ensure safety and quality, accurate labelling, reduced access to young people etc, while allowing access for adult smokers for whom they can be lifesaving. No. The regulations cover all products both imported and locally manufactured. It is the fact that these products are illicitly supplied, deliberately evading the regulations, that results in their causing harms which the regulations are designed to prevent. If the “vaping” suppliers claim that their products are of some therapeutic value and want to make them legal, they are perfectly free to apply to have their products registered as medicines, just like the manufacturers of legal nicotine-containing pharmaceutical products have done. But they refuse to do this, presumably because they know that the data doesn’t show that the products are safe and effective. There are no regulations covering these products because they are not legal or approved by the authorities. However they continue to be used. Prohibition doesn’t work. We need to legalise them so we can regulate them. You can’t regulate something which is illegal and officially doesn’t exist. Vaporisers do not make therapeutic claims and are not therapeutic products. They are consumer products designed to replace an existing far more harmful consumer product. They should therefore be regulated by the ACCC. It does not make sense to require the highest standards of research and quality for nicotine vaporisers when they are replacing a far more harmful product, lethal cigarettes, which are virtually unregulated. The issue is not whether vaping is safe, but whether it is less harmful than smoking. The UK Royal College of Physicians and Public Health England have concluded that long-term vaping is at least 95% less harmful than smoking. There is growing evidence that these products help some, not all, smokers to quit. They are at least as effective as NRT. If you had a friend or relative who couldn’t quit with all other methods and had a 2 in 3 chance of dying from continuing to smoke, would you recommend they try vaping or just continue smoking? so which is it Colin, are they “not therapeutic” or are they “lifesaving”? If “They are at least as effective as NRT” then regulation by the same body that regulates NRT is appropriate. You’re tying yourself in knots trying to shill for these products. Regarding the comments from Conjoint A/Prof Colin Mendelsohn that they are at least as effective as NRT. e Liquids containing nicotine and used with vape devices could also be considered as a form of NRT. I have been vaping for some time now and I feel a whole lot better than I did smoking 20 – 30 cigarettes per day. The public and the media is always telling us the ingredients of e Liquids could be harmful, but what they do not do is provide a comparison with tobacco products that are far more harmful. On another note: the law states that is illegal to purchase and/or poses liquid nicotine except for use in laboratory conditions and under strict supervision. I have witnessed members of the general public being in possession of bottles of nicotine (up to 500ml) for the purpose of adding it to nicotine free e Liquids. Enough to kill a herd of elephants. These were purchased from overseas and customs did not stop the importation. As an ex smoker and now vaper of more than five years I agree with you completely about the claim. I vape to avoid smoking which is a health, soul and financial destroying product. But nicotine is very enjoyable and does me no harm whatsoever. In fact, now in my 50’s, I see it as a preventative product for future health problems such as Parkinsons and Alzheimers. I’ve also realised since I switched that nicotine use helps me concentrate and cheers me up when I am down and calms me when I am stressed. The hand to mouth action cannot be underestimated. I can make the above claims because they are my personal experiences. However, a manufacturer or supplier of vape products cannot and to my knowledge they generally don’t in Australia. There have been a few instances which the ACCC has jumped on quite quickly and punished them for doing so as the current regulator as they should. If you see health claims, contact the ACCC and they’ll be on it like a red rag to a bull. Your point about manufacturers refusing to apply for medicines regulation is a valid one. My point though is that vaping works because it’s not a medicine. Also Australia is such a small fish in a big pond and yet overseas, there are no vaping products that have been approved and brought to market as medicines. I think that this fact might inform you that even the manufacturers know people won’t buy them. I can’t speak for all ex smoking vapers (or potential ex smoking vapers) but what I do know is that while smokes are available to purchase on every street corner in Australia, vaping should be treated as a consumer product. Nicotine in reasonable strengths, with correct packaging, warning labels, age restrictions and consumer education are needed to offset potential problems. The fact that possession and/or use of nicotine vaping attracts up to a $45k fine or two years in jail tells us that we are focused on the much less harmful product than most harmful product ie. cigarette smoking. They are both. Vaping is a tobacco harm reduction strategy, not a medical treatment. Smokers switch to a far less harmful form of nicotine without the tar, CO and other toxins in smoke. By helping users to eliminate most of the toxins in tobacco smoke they are lifesaving for some. This doesn’t follow. Exercise may be as effective as ace inhibitors in reducing cardiovascular risk, but regulation of exercise by the Medicines Regulator is not appropriate. I support the use of these products because they are a much less harmful substitute for smokers who are otherwise unable to quit. I follow the research closely and have also seen them work in my practice. In my opinion, they have huge potential to improve public health. I need no other reason than that. In countries where vaping is legal, smoking rates are falling. In Australia they are not. That it is illegal to buy a product 95% less harmful than cigarettes whilst legal to buy cigarettes makes no sense. Those who switch to vaping significantly reduce their risk of premature death and disease from smoking. Is it therapeutic or life saving? Depends on the individual. The more important question being, is it less harmful than smoking? USA: 13.8% (cigarettes only: other exclusive combustible tobacco product users to be added). Do research limitations get any more fundamental than that? You really crack me up with laughter Colin. Almost everything you say contradicts yourself. e-cigs versus NRT is not at all like ACE inhibitors versus exercise. e-cigs are exactly the same type of product as NRT – devices to deliver nicotine to the brain with the claim that this helps stop the urge to smoke tobacco.. The only difference is that NRT products are PROVEN to be safe and effective and so are registered as medicines in every country. E-cigs are not accepted as medicines in any country and their promoters try to excuse this by cla9iming that they’re not medicines and then claiming with the same breath “trust us, they work, and they’re safe, but don’t ask us for data to prove it”. You and the other e-cig promoters are like if a company brought out a new brand of ACE inhibitor and claimed that it is as effective or more effective than other ACE inhibitors, but refused to provide any data showing it, and refused to apply to register it as a medicine, claiming that it’s not really therapeutic, it’s just like exercise, and selling it through illicit channels. As I explained in detail above, ecigs are consumer products. Medicines regulation is not appropriate. Why should they be regulated more strictly than cigarettes which can be bought at every corner shop? This RCT evidence supports the results of previous RCTs, population studies, well designed observational trials, impact on national smoking rates and anecdotal reports. If that is not enough evidence for you that ecigs help smokers quit, then you are not seriously open to the evidence. When many years after all the hype from tobacco companies telling us that smoking cigarettes was not harmful, showing pictures of supposedly doctors smoking, pictures of athletes and movie stars smiling and advocating the habit while peddling the prevalence of one make from another, it showed they (tobaccos companies) lied, we couldn’t even make them accountable or sue them because they used the words ‘We believe they are not harmful when questioned by Congress in the USA’. Feeling better after 5 years use of smoking e-cigs is no recommendation – not even 15 to 20 years in my case of smoking tobacco cigarettes. I still felt fine. 20+ years later, although I only caught a cold once a year, it developed into bronchitis, then into pleurisy. That was when I decided to become a non-smoker. In my case, a year of self-denial with my subconscious trying every trick in the book to get me to go back to smoking. It didn’t succeed, gave up the fight and today I have absolutely no desire to start that filthy habit again, nor replace it with something that may be equally dangerous to my health in years to come. We are much more aware about the motivation to do anything comes from our subconscious programming, our feelings and emotions, beliefs and perceptions. We know that some people are more the addictive type than others. What may have started off as the ‘thing to do’, turns into habit and then dependency (or Obsessive Compulsive Disorder might be a better name for it). In our medical practices, we give a prescription drug to cease or manage that dependency. We don’t want our youth to take up a habit because we give them the opportunity to do that easily. And the meta-analysis in the link shown below shows the prevalence for e-cigarette users to embark from that to smoking tobacco cigarettes. As it shows at least a perceived benefit to aid adult smokers, and to avoid dependency for young people, I feel it would make sense for adults to be able to obtain a prescription for e-cigarettes, if it is too hard for them with other means. As adults they should sign a legal agreement that they have been told about the possible dangers of long-term use so that the health department and doctor are not responsible for any detrimental health outcomes. Colin Mendelsohn writes “ecigs are consumer products.Medicines regulation is not appropriate. Why should they be regulated more strictly than cigarettes which can be bought at every corner shop?” Then, amusingly, and without pausing for breath, in his very next sentence he goes on to tell us about how effective they are compared to NRT, a TGA regulated medicine, not a “consumer product” , whatever that might mean. Tobacco products are regulated in many ways that Mendelsohn opposes for ecigs. All advertising and promotion is banned; the sale of fruit and confectionary flavoured cigarettes is prohibited in South Australia, New South Wales and Tasmania; retail display of tobacco products is banned nationally; smoking in all enclosed and several crowded outdoor area like stadiums; all products are plain packaged; they are heavily taxed; smoker can import just 1 pack at .duty free entry. Mendelsohn wants none of that for ecigs. But more fundamentally, The dangers of smoking were not fully understood for at least 40-50 years after mass consumption and the commerce that facilitated that had commenced in the first decades of the C20th. It then took us 40 -50 years between the 1960s and today to fight for the policies that have together taken smoking down to its lowest ever levels. Out of ignorance, we made every regulatory mistake possible when cheap, mass produced cigarettes appeared. Our understanding of the health risks that may be posed by ecigarettes is in its early infancy, given the latency periods that apply with the development of chronic disease. It is often said that if cigarettes were invented tomorrow, and we knew now what we didn’t know when they were invented, no government in the world would permit their sale. Very few people (me included) are saying we should ban ecigarettes. But nearly every health and medical agency is saying that they should be strongly regulated through the TGA so that over time, as knowledge increases we could review whether looser or stronger regulation (including bans) was appropriate when that knowledge is available. We deserve better than Mendelsohn’s glib comparsion.